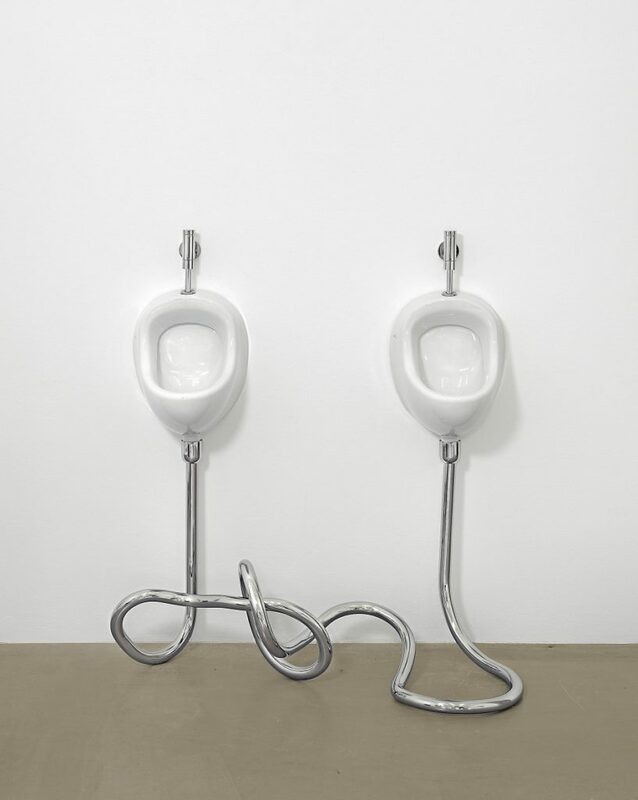 The Verse’s Jake Francis attended the Elmgreen and Dragset exhibition at Whitechapel Gallery. This is what he thought. Alas, this is not a trope that is exclusive to films; a truth that is easily recognised in that ever-fickle and transient context of ‘the art world.’ Whether this is on an individual basis (Damien Hirst) or with a group like the YBA’s (also Damien Hirst…), many a promising career or trajectory can very easily go south. Fortunately, this is not the case with Elmgreen & Dragset’s latest exhibition at the Whitechapel Gallery – an event that is consistent, strong, and alluring…like a stick of seaside rock. With the title ‘This Is How We Bite Our Tongue’, the duo’s relationship is firmly cemented from the offset. Referring to a singular lingual muscle, the exhibition represents a sort-of mini-retrospective of the pair’s 20ish years of practice. One that is rife with social commentary, jarring narratives, and alluring grace. Dabbling in numerous arty-territories, Elmgreen & Dragset have become synonymous with actualising human relationships with witty prods and everyday ‘edits’. Despite popular idioms about life after love, the former romantic partners have proved otherwise. Surpassing their previous relationship with a platonic concern for well-versed humanist critique. On entry to the exhibition, one is welcomed with the pair’s incredibly grandiose commission, ‘The Whitechapel Pool’ (2018). Perhaps the very embodiment of juvenile disappointment. This site-specific artwork consists of a derelict public pool, ripe with all of the recognisable trimmings; changing rooms, life rings and a not so submerged access ladder. Conceived as a blunt representation of ominous public austerity, the oddly accurate pool embodies the duality of artistic ambition and meagre municipal platforms. Encapsulating visitors within an audible and visual void, the pool and its gallery-laden security creates a rigid, and very literal, representation of desired interaction; it is the very anthesis of a lost opportunity. With the glee and disappointment in constant transition, Elmgreen & Dragset appear to be aware of your distractions and take advantage. This is clear in ‘Changing Rooms/Powerless Structures Fig.128’ (2018), an ambiguous door with two handles but no access. Clearly, the artists’ have no desire to impede our questioning. Challenging the function of our every day in a flip-flopping of inclusion and exclusion. Amongst this detritus, the installation boasts a number of surreal neighbours. Each peppered with the understated visual quips that have made the pair infamous. Most notable is the cathartically-juvenile ‘Too Heavy’ (2017). 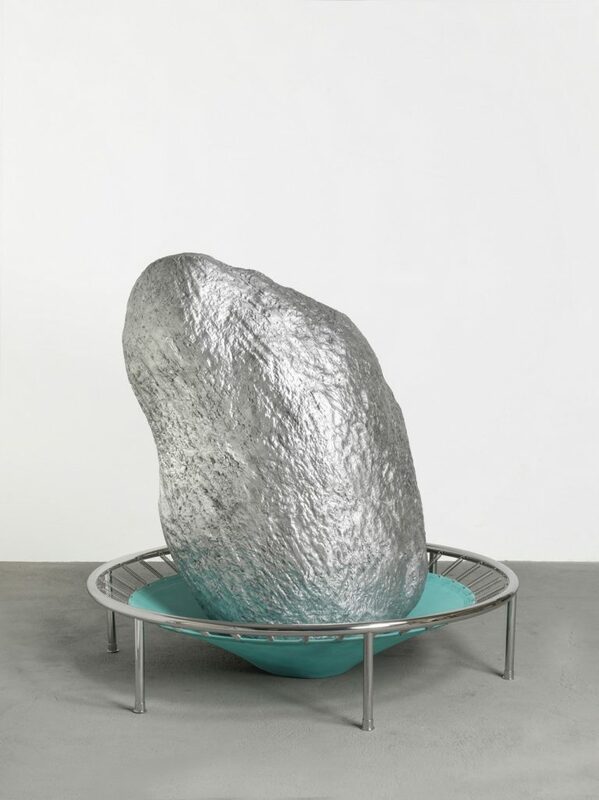 An installation that depicts the bulk of other-worldly ‘stone’ of meteorite proportions on a dysfunctional trampoline. Nearby is ‘Gay Marriage’ (2010). A sculpture that revisits a common practice configuration of domestic fittings entwined in a functionless matrimony. Heavily doused in recognisable avant-garde theory, the pair liberates the everyday object from elitist (and cliche) art expressions into empathetic symbols of human relationships and forced social compromise. Upstairs, we are treated to a slightly off-kilter sculpture of a semi-plausible baby nestled under a makeshift 24HR ATM. This cadre of absurdity is called ‘Modern Moses’ (2006). An installation that naturally brings a simultaneous questioning of our philosophical and spiritual beliefs, and the systems that govern our capitalist (and lopsided) communities. The room that sits parallel to this stairwell ‘nativity’ is much more ‘reserved’. Boasting only an impressive desk, and gargantuan-sized labels fabricated in marble. Although this initially appears to be a little coy in comparison to the former, it soon becomes clear that there is a tad more on offer than first thought. 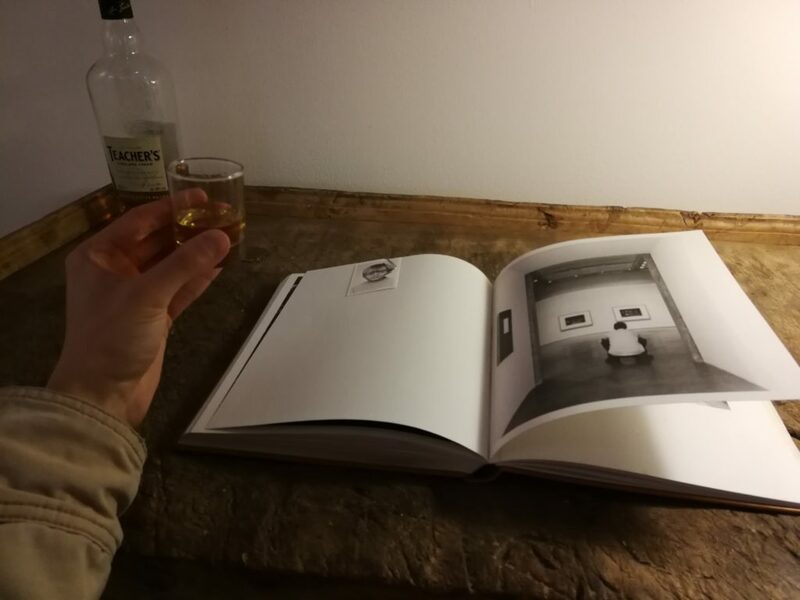 The desk and its accessories are named ‘The Bottle and the Book’ (2015), and they soon become another asset in the pair’s arsenal of refining art spectatorship. If confident enough to ask the nearby attendant, one can sit at the desk and peruse the unique handbound book/diary on display. This is accompanied by a shot of whisky that is handed to you from the very bottle that once denoted a mute art object; suddenly the fee to enter the exhibition doesn’t feel so burdensome. Surrounding the desk in this cosily lit room are the before mentioned labels. Each entitled as ‘Self Portrait’ with a prevailing number. (2015 – ) Despite initially feeling a little out of place and ambiguous, these enlargements of the ever-present, ever-overlooked labels imply a sensibility of influence and significance; the artists and artworks highlighted serving as an accolade to a network of peers that have inspired the duo in their communal exploits. Perhaps the most anticipated presence within the show is the white bronzed pristine totems of circumstance that linger in the final room; a highlight that is utilised by the gallery for their wide-reaching marketing campaign. A long, spotlighted hall hosts a tightly controlled environment of situation, personality, and paused narrative; it is as if we have opened a page on an unknown book to find our cast paused in a semi-familiar scene. The highlights of these include ‘Emerging’ (2016) and ‘Invisible’ (2017); the former displaying a vulture prying over an unsupervised nest. The latter a small boy curled up in a black vacuous fireplace. Each of these installations symbolises the artists’ skill to create an unsettling and awe-inspiring concoction of uncertain feeling; does the nest belong to the vulture, and if not who? what are its intentions? Why does the boy appear so melancholic? Are we to read his temporary shelter as one of comfort or one of imprisonment? Regardless of which answer we choose to accept, Elmgreen & Dragset undeniably lead us down an uncanny path of mutual assumption and presumption; a cacophony of suggestibility, double entendre and self-control. 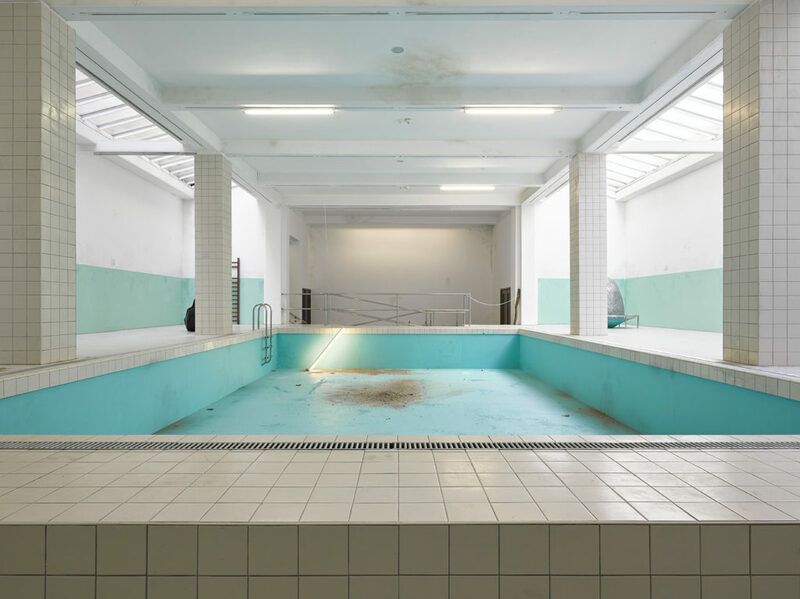 Although Elmgreen & Dragset’s infrastructure of symbols and environments may not appeal to everyone (it is contemporary art, after all…) their presence, priorities, and output are formidable. Few artists would be able to take such a dive (pun intended) into an exhibition that could capably mash a concoction of styles into a coherently potent collection; many pieces having nothing in common bar a quality of the red herring. It is arguable that ‘Portrait of the Artists’ (2018) is the unequivocal centre to the shows conceptual intentions. Despite being the least ‘visual’ throughout. It consists merely of two nails and a shadowed discolouring of the wall. The implication of removal and mirrored depictions are brought into the frame by proxy. It remains clear that the self is not exclusive to portraiture and literal representation. However, in reflection to things of meaning, to contexts, and within our relationships. If that doesn’t sound intoxicating, the whisky surely will. ‘This Is How We Bite Our Tongue’ by Elmgreen & Dragset is now on display at the Whitechapel Gallery until the 13th of January 2019. Student entry is available for £9.50 with valid ID, with general admittance charged at £12.95.